Protesters rally in downtown St. Louis as fans arrive for a Billy Joel concert at Busch Stadium on Thursday, Sept. 21, 2017. Missouri is again at the center of a racially charged conflict after a judge acquitted a white former St. Louis police officer of first-degree murder in the death of a black drug suspect. The Sept. 15 verdict provoked angry protests in a state still not fully recovered from the unrest that followed the 2014 death of Michael Brown, a black 18-year-old shot by a white officer in the suburb of Ferguson. Scholars and activists say the latest demonstrations in Missouri, like the Ferguson protests, aren’t just about another police shooting. They reflect unaddressed racial disparities going back generations. Hours after a judge acquitted Jason Stockley in the 2011 shooting death of Anthony Lamar Smith, downtown St. Louis came to a standstill as marching protesters blocked traffic. The demonstrations went on for days, with multiracial protest crowds swelling to thousands of people and spilling into a popular nightlife district in western St. Louis, the hip Delmar Loop area of nearby University City and into two shopping malls. As the protests intensified, a St. Louis synagogue gave demonstrators shelter after police deployed tear gas. More than 160 people were arrested, and some officers were injured by hurled bricks. Although the latest events have centered in St. Louis, the whole state has faced recent scrutiny over racial disparities. 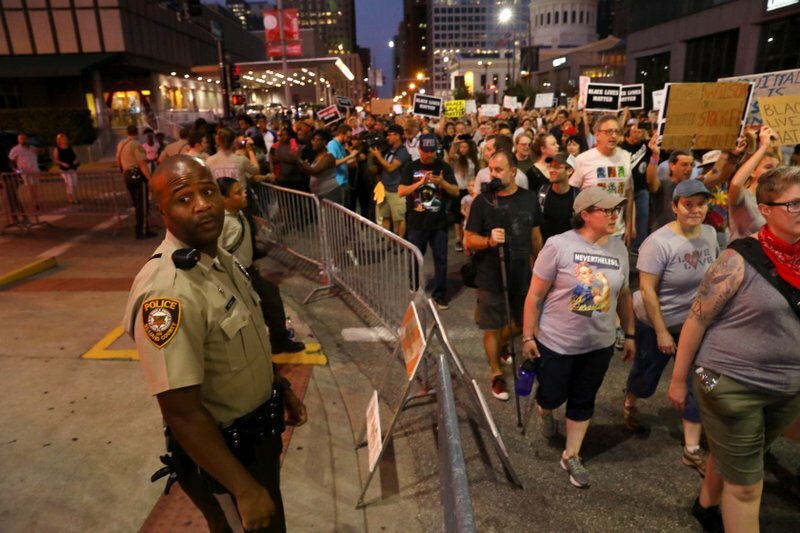 The NAACP’s national delegates voted in July to issue a travel advisory for Missouri, citing reports that African-Americans were more likely than whites to be stopped by law enforcement officers there, as well as other current and past racial issues in the state. Earlier this year, the Republican-led state Legislature passed a much-debated law that raised the standard for suing for workplace or housing discrimination, a vote that drew scorn from civil rights leaders. And last month, a white Missouri House member posted on Facebook that he hoped whoever vandalized a Confederate monument in the southwest of the state would be hanged, sparking calls for him to resign. Before that, a black Democratic state senator posted and later deleted a comment on Facebook about hoping for President Donald Trump’s assassination. The Republican-led state Senate formally reprimanded the Democrat, while the GOP-led state House took the less serious step of opening an ethics review of the Republican. Advocates point to the state’s second-largest city as a place where racial inequalities are evident and often ignored. Stockley’s acquittal was the latest evidence of a pattern that “African-Americans are subjected to a totally different justice system,” Derrick Johnson, interim NAACP president and CEO said in a statement. Smith’s death and the deaths of “countless other victims of police brutality” in Missouri are why the NAACP issued the travel advisory. According to the U.S. Census, the unemployment rate among African-Americans in St. Louis County was 15 percent in 2015, compared with 5 percent among whites. The county’s poverty rate for African-Americans was 22 percent in 2015 compared with 6 percent for whites. Nationally, the unemployment rate among African-Americans in 2015 was 10 percent. A 2015 report titled “For the Sake of All” produced by Washington University and Saint Louis University found that mainly black St. Louis ZIP codes in some cases had an 18-year difference in life expectancy when compared with largely white ZIP codes. That type of stark difference formed the basis of a warning issued nearly 50 years ago in a report by the Kerner Commission — a panel appointed by then-President Lyndon Johnson to examine the causes of urban riots in the late 1960s. The commission predicted that cities would continue to see racial tensions if communities did not address racial barriers, poverty, housing discrimination and conflicts between police and minority communities. Harris said he was encouraged by the activists in Missouri. Norwood said she, too, was somewhat optimistic. Days after the demonstrations paralyzed St. Louis, the city’s Board of Aldermen voted to approve a one-year trial for police body cameras. She was also heartened to see that the protests in St. Louis and Ferguson were diverse and included white and Asian-American protesters.